TGF-beta1 is a 25.0 kDa protein with each subunit containing 112 aa, linked by a single disulfide bond. It is the mature protein after cleavage of the signal peptide and latency-associated peptide. Our Abpromise guarantee covers the use of ab50036 in the following tested applications. The ED50 was determined by TGF-beta1's ability to inhibit the mouse IL-4-dependent proliferation of mouse HT-2 cells is ≤ 0.05 ng/ml, corresponding to a specific activity of ≥ 2 x 107 units/mg. Greater than 98% by SDS-PAGE and HPLC analyses. TGF-beta is secreted predominantly as latent complexes which are stored at the cell surface and in the extracellular matrix. The release of biologically active TGF-β isoform from a latent complex involves proteolytic processing of the complex and /or induction of conformational changes by proteins such as thrombospondin-1. TGF-β1 is the most abundant isoform secreted by almost every cell type. Centrifuge the vial prior to opening. Reconstitute in 10mM Citric Acid, pH3.0 to a concentration of 50 µg/ml (e.g. 5 µg/100µl). This solution can then be stored at room temperature or at 4oC for 1 month. It is recommended that further dilutions be made in PBS containing 2 mg/ml albumin and stored at -20oC for future use. The level of CTGF expression can be induced by TGF beta treatment (PMID: 17786299). CTGF is constitutively expressed in HepG2 cells (PMID:15886528). I have reviewed with our sources the TGF beta 1 proteins that we have on our catalog. It seems the most suitable would be ab50036 TGF beta 1 protein (Active). https://www.abcam.com/index.html?datasheet=50036 (or use the following: https://www.abcam.com/index.html?datasheet=50036). This should be suitable for use on human cells, as it is a human protein. Unfortunately, I am sorry we do not have any information if it has been used specifically for in the in vitro induction of EMT in human cell lines, but there are many references on our website for this product which state usage of this product in a variety of applications. I do not have Citric acid available in my lab. Is there an alternative acid that I can reconstitute this in (such as HCl)? HCl can be used as an alternative at the same recommended molarity and pH (10 mM, pH 3). I see you recommend reconstitution in Citric acid. In order to conduct my experiment and make comparisons across cytokines that I am reconstituting in acetic acid, I was hoping to be able to reconstitute ab50036 in acetic acid instead. Do you foresee any issues with this or have any recommendations? It is important to strictly follow the reconstitution protocol on the datasheet. Reconstituting our TGF-β1 in acetic acid instead of the recommended citric acid will not fully dissolve this product in solution which may adversely affect its performance in an assay. Inquiry: How to do reconstitution of ab50036 and ab84070. Thanks. Thank you for contacting us. Reconstitution instructions for the proteins are below. store in working aliquots at -20oC to -80oC. I want to use VEGF protein (ab51967) to inoculate it in lab. animals (rats) . I want to reach to a dilution 1 µg/ 100 µl and 1 µg/ 1 µl. How can I do that? which diluent can I use? the same thing for TGF beta 1 protein (Active) (ab50036). 1. Centrifuge the vial prior to opening. 2. Reconstitute in 10mM Citric Acid, pH 3.0 to a concentration of 0.1-1.0 mg/ml. Do not vortex. 3. For extended storage, it is recommended to further dilute in a buffer containing a carrier protein (example 0.1% BSA) and store in working aliquots at -20oC to -80oC. These conditions are optimized to ensure complete solubility and required bioactivity of Human TGF-β1. I would advise to strictly follow the protocol to avoid loss of activity. Below is an article published in 2009 where the authors used a Human TGF-β1 in vivo. Reviewing this article may be helpful for further information. Freeman, I The influence of the sequential delivery of angiogenic factors from affinity-binding alginate scaffolds on vascularization. Biomaterials;30(11):2122-31. 17 Jan 2009. PMID 19152972.
ab51967 is delivered in 10ug. First, make the 1ug/ul solution by diluting the 10ug in 10ul of water. Then, take 1ul of that solution and dilute it in 99ul of water to make the 0.01 ug/ul solution. ab50036 is delivered in 5ug. First, make the 1ug/ul solution by diluting the 5ug in 5ul of 10mM Citric Acid, ph3.0. Then, take 1ul of that solution and dilute it in 99ul of 10mM Citric Acid, ph3.0 to make the 0.01 ug/ul solution. For longer term storage at -20oC of the 0.01 ug/ul solution, 99ul of PBS containing 2 mg/ml albumin can be used instead of 99ul of 10mM Citric Acid. Are those proteins below injectable in Mice? Thank you for contacting us and for your patience. I had to contact the laboratory in order to get more information about the use of these three proteins. I can confirm, that for the ab92965 SPARC protein (MBP) to our knowledge it has not been tested for injection in mice or other animals (besides it uses as immunogen for polyclonal antibodies production in rabbits intramuscular). It could be that it will work for injection in mice but we can not guarantee this and we have no information about different administration routes (intravenous, intramuscular etc.). The below customer has bought this item have some doubt . He is asking how he can be sure that he has received the 5ug products after reconstitution as he could not see anything. I like to reassure that if there was no protein in the vial that will be covered by our guarantee and we will be pleased to provide a credit note, free of charge replacement or refund if that is this case. I can confirm that 5 ug is a very small amount. It can not necessarily be seen even after centrifugation. Could you kindly provide the result of the earlier discussed SDS-PAGE? The result should confirm rather there is some protein in the vial or not. I hope this information is helpful to you and looking forward to receive the requested information. if i filter sterilize this product will it affect the activity? Thank you for contacting us. This TGF beta 1 protein (ab50036) has been sterile filtered through a 0.2 micron filter prior to lyophilization and it would therefore not be necessary to sterilize it again. Filtration with a 0.2 micron filter will not have any effect on the activity, however. I hope this helps, please let me know if you need any additional information or assistance. 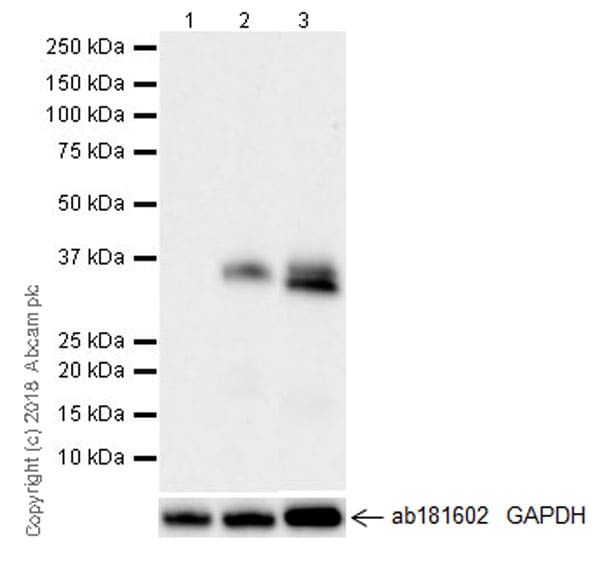 Can you please tell me if cat#ab50036 has any carrier proteins added to the preparation and, also, what was in the buffer before lyophylization? The TGF beta 1 protein ab50036 is supplied carrier-free and was lyophilized from a solution containing 0.1% trifluoroacetic acid. Centrifuge the vial prior to opening. Reconstitute in 10mM Citric Acid, pH 3.0 to a concentration of 0.1-1.0 mg/ml. Do not vortex. For extended storage, it is recommended to further dilute in a buffer containing a carrier protein (example 0.1% BSA) and store in working aliquots at -20oC to -80oC.